The top section consists of a moulded cornice with boxwood stringing above two glazed doors in the Gothic manner consisting of crossgrained mahogany and boxwood stringing with original glass and two shelves to the interior. The secretaire consists of two faded mahogany oval panels consisting of boxwood stringing, mahogany crossbanding and mahogany veneers to the corners with central brass lion mask handles. The interior consists of six mahogany lined satinwood drawers with turned bone handles with pigeon holes below with a larger open compartment to the centre. 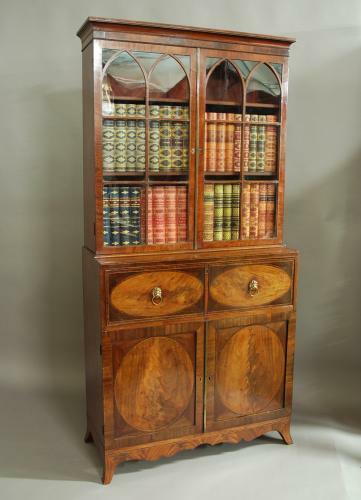 The lower section consist of a cupboard with two doors, both having fine quality faded curl mahogany veneered oval panels with boxwood stringing, mahogany banding and mahogany to the corners. The interior of the cabinet has no shelves at present but a shelf can be fitted by ourselves if required. The bookcase is supported by a sophisticated splay base with a shaped frieze of curl mahogany. This piece is in good original condition, is of stable construction and can go straight into a home or office etc.